It's that time when we write of retrospectives, and 2013 was a pretty epic year when it came to food. I had the privilege of traveling to multiple countries, and getting to try some dishes for the first time, and distilling new insights about the experience and communication of science and food. Going over them, and narrowing them to a small select list of experiences that are the most notable of the year was difficult - but these are dishes or experiences that I wouldn't mind revisiting. Even though in some cases, I don't think they can be replicated. The vegetable focused Oxheart is one of the most celebrated restaurants in Houston, and in 2013, I managed to go dine there. And the pretzel rolls from Karen Mann was the standout course of the evening. The most egregious thing about it was the fact that I couldn't buy a bag of these rolls to bring home for later. Chef Steve Marques (check out his new blog) made the move from CoalVines in Sugarland to Executive Chef of BRC in Houston, but while there I got to taste his house made ginger ale, paired with oysters. The flavors of that drink is memorable to this day, nearly a year later. This was an enlightening delightful nonalcoholic pairing menu, a lavish experience few other chefs try to follow. Many Southeast Asian cuisines treasure soured soups/stews. In the Dumaguete, the Philippines, you can purchase the tail and neck chunks of the whole roasted pig (the lechon), and ask them to make the tamarind soured soup singingang. The resulting dish, savory, intensely flavored, unctuous, rustic, is rarely seen in America. Among the ethnic Chinese communities of Malaysia and Singapore, the Lunar New Year is welcomed with yusheng (sometimes called yee sang) - a raw fish salad that is ritualistically assembled, and then members of the table toss it together. The higher the tossing, the better the luck - which, of course, can lead to quite a bit of the salad decorating the table outside the plate. But it's a festive time - the Greeks would understand. While in Singapore, I got to indulge in a bit of kuih lapis - a grilled layer cake. Traditionally, this is done by pouring thin layers of cake on top of the prior cooked layer, and then it cooked by broiling it to cook. In a sense, it is a cognate to the grilled cake in Germany called baumkuchen. In San Diego, I encountered brussels sprouts tempura at Okan. It was simple, delicious. And genius. 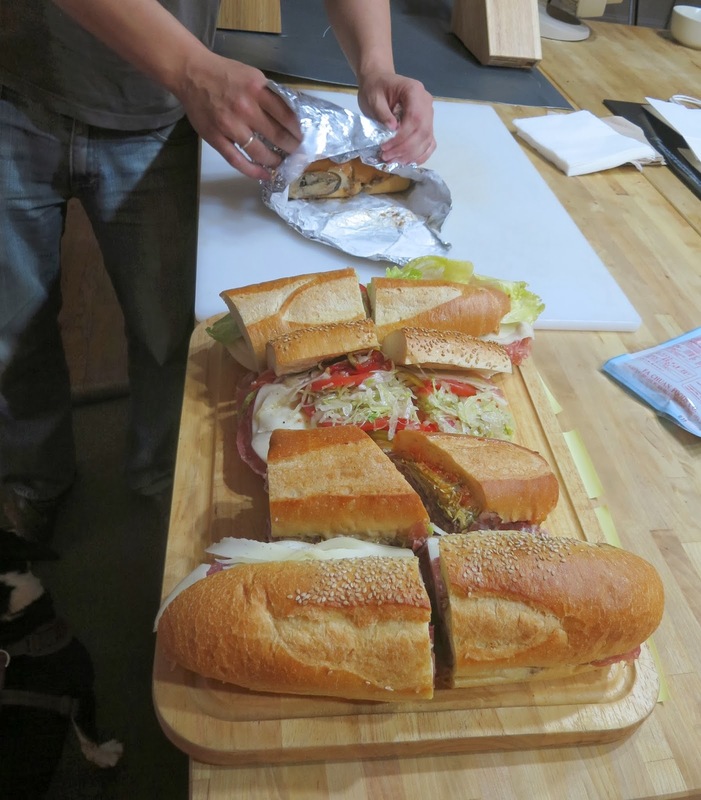 On a visit to New York, I paid a visit to the hardworking crew at SeriousEats.com, and got to taste a sampling of Italian subs (and in Little Italy, where SeriousEats is headquartered, the versions are diverse and delicious). I hope to visit them again, it was a fun experience, an eye opening lunch where eating and tasting as indeed serious business. While in New York, I made it a point to sample the wares at Spot Dessert Bar, the dessert centric restaurant under direction from Pichet Ong. These are fun, multicomponent desserts, sweet dishes that have been given care and thought. This matcha molten chocolate cake is a crowd favorite, not only due to the flavors but also because it has such a visual and textural impact. The amazing thing is that these desserts are rarely more than $8, in Manhattan no less. We need to do our desserts better, Houston. I hate to give out this little secret, but the German Pie at Casamia Bakery on Bellaire is one of the hidden pastry gems of Houston. Not too sweet, it's a balanced combination of crust, cream, and caramelization. A plethora of delicious things are to be found at the menu at Bong Ga in Houston, but this short rib stone pot was an eye opening surprise. Spicy with a kick to the back of the throat, it is cooked to be tender enough to be cut, but not so falling apart - which makes it feel substantial. Highly recommended. Blacksmith Coffee in Houston has been hosting monthly popup dinners, and this sweetbreads with okra dish from Chef Michael Gaspard may be the most creative take I've had on okra all year. We have at least two Taiwanese restaurants in Houston, and they are quite different from each other. One of them, Formosa Bistro, has the most curiously named "Fried Denitrified Pork Leg" on the menu. It's difficult to describe the experience, but it easily rivals and maybe exceeds Peking duck. The pork leg itself easily falls apart, but is crunchy and greaseless. I think it could've benefited from a good plum sauce but we finished it off and craved more. 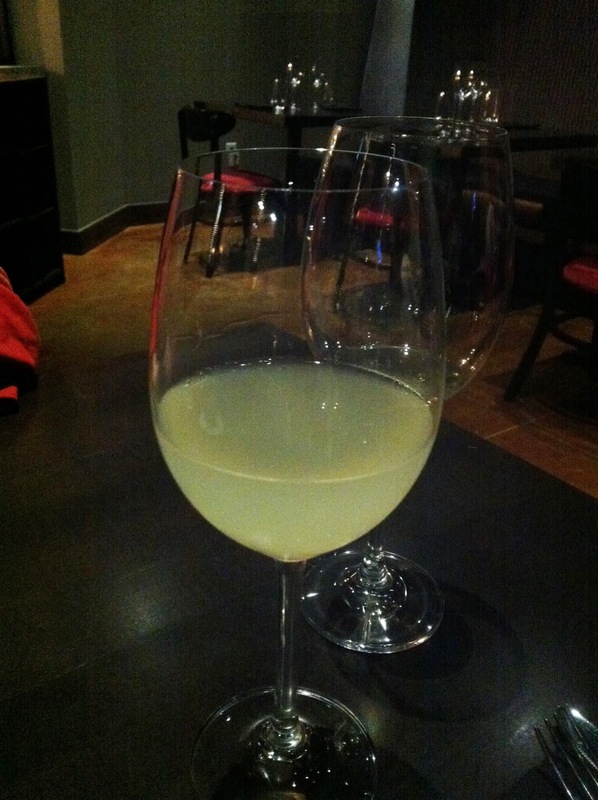 Unusual that on my list for 2013 I got to include another drink. 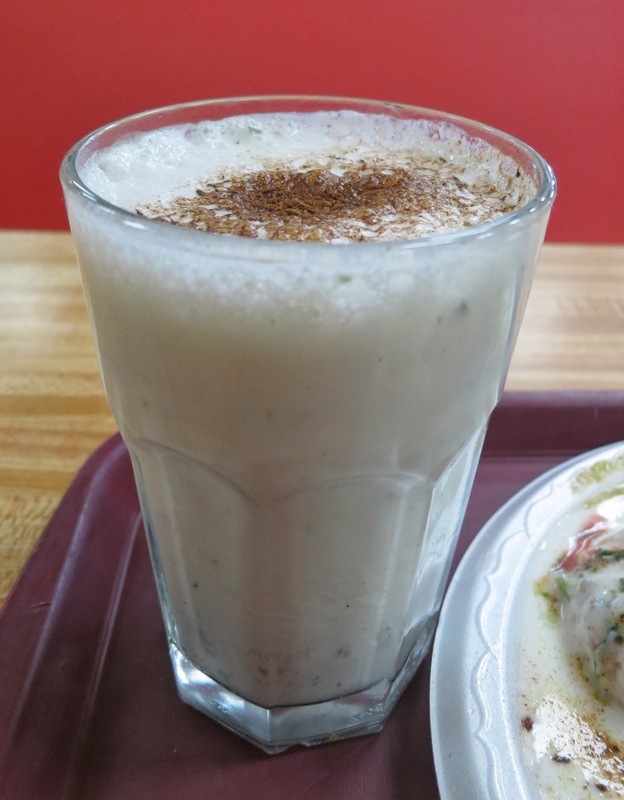 Order mint lassi at Bombay Sweets, and it can come sweetened or salted, chilled, or room temperature. I didn't choose, I just couldn't predict which version would arrive. But the sweetened cold mint lassi was a beautiful foil for a hot Houston summer day. And a bhel poori. At the African restaurant Finger Lickin' Bukateria, the catfish dish - simply called "Catfish" - turned out to a delicately cooked fish with a punchy sauce. The catfish was a perfect match for this preparation, and the strong flavors prompted yet another knob of fufu. I must call an honorable mention to this dish. My first visit to BRC Gastropub in Houston was before Steve Marques accepted the executive chef position. To call the food then forgettable would have been charitable. The descriptions on the menu were promising, but the execution was sloppy and lackluster. Put a new man at the helm, and the turnaround was immediate. 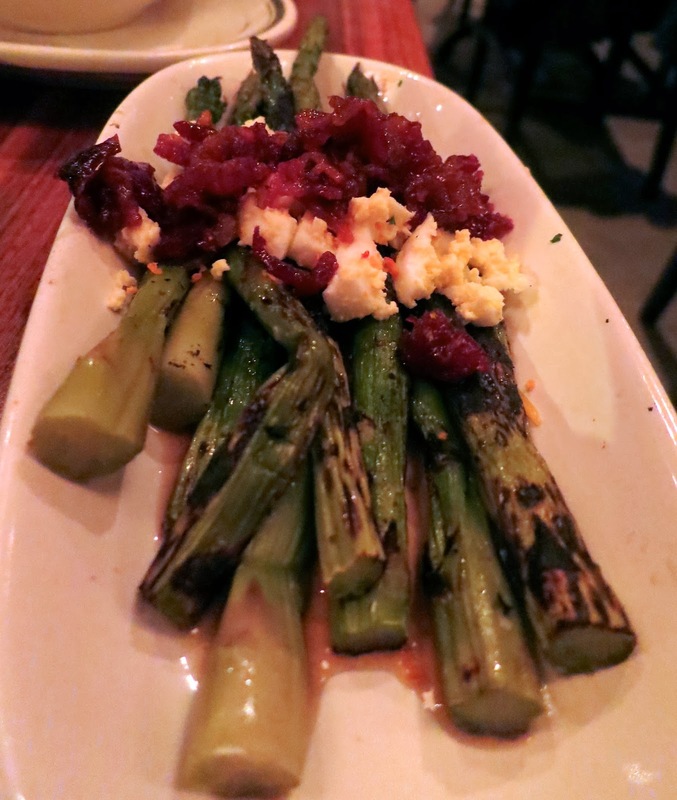 I had the grilled asparagus in its original incarnation, and was struck by how it was reborn later. The smoke from the char married beautifully with the gribiche and bacon dressing. There you go. Food of the year crammed in a very large nutshell. Here's looking forward to 2014.